Classification of the 3 trocar site hernias. A, Normal stab wound of trocar site. B, Early-onset type: dehiscence of anterior and posterior fascial plane and peritoneum. C, Late-onset type: dehiscence of anterior and posterior fascial plane. Peritoneum constitutes hernia sac. D, Special type: dehiscence of whole abdominal wall. Protrusion on intestine and/or omentum. Interval between original laparoscopy and the onset of the symptom of trocar site hernia. SBO indicates small-bowel obstruction. Objective To review the relationship between the pathogenesis and clinical manifestations of trocar site hernias seeking to confirm the definition of trocar site hernias by classification. Data Extraction and Study Selection We limited the main operations to cholecystectomy, colon and rectal surgery, fundoplication, and gastric surgery; finding 44 reports on these procedures. Of these, 19 were case reports, 18 were original articles (setting criteria; the incidence of the trocar site hernia was clarified, and involved >100 patients), and 7 technical notes on “how to do it” were collected. We obtained 19 additional reports using the references of those previously obtained. We, thus, reviewed 63 reports (24 case reports, 27 original articles, 7 technical notes, and 5 review articles). Data Synthesis Trocar site hernia was classified into 3 types. The early-onset type that occurred immediately after the operation, with a small-bowel obstruction, especially the Richter hernia, frequently developing. The late-onset type that occurred several months after the operation, mostly with local abdominal bulging with no small-bowel obstruction developing. The special type that occurred indicated the protrusion of the intestine and/or omentum. Trocar site hernias with fascial defects of 10 mm or larger should be closed, including the peritoneum. Opinion varied if a 5-mm trocar site defect should be closed. Conclusion It is useful to clearly classify trocar site hernias to improve management of laparoscopic procedures. Fear5 first reported a trocar site hernia in his large series on laparoscopy in gynecological diagnosis. Many authors have recognized this as the first report on trocar site hernias.2,6-8 Maio and Ruchman9 then reported on the trocar site hernia with small-bowel obstruction occurring immediately after cholecystectomy; this being the first report on trocar site hernias in digestive surgery. Since then many reports have been published about cholecystectomy, and more recently on gastrointestinal surgery. In the published reports there is enormously wide variation in the clinical aspects of trocar site hernias; so much so that we became concerned about the meaning of the medical term “trocar site hernia,” as it is not clearly defined. We reviewed earlier reports on digestive surgery to identify factors that might improve management of laparoscopic procedures. We hope to see the confirmation of a clearer definition for trocar site hernias and recommend our classifications to enable more accurate clinical identification. Crist and Gadacz10 defined trocar site hernia as the development of a hernia at the cannula insertion site, and this term has been used in many articles; however, “port site hernia” has also been used in other articles in similar situations. First, we searched this subject on MEDLINE combining “trocar,” “hernia,” and “laparoscopy” and that resulted in 186 reports in English. Second, we combined “port,” “hernia,” and “laparoscopy” which resulted in 90 reports in English. We then limited the main operations to cholecystectomy, colon and rectal surgery, fundoplication (ie, operation for gastroesophageal reflux disease), and other gastric surgical procedures (eg, obesity surgery) that are supposed to result in the same operative insult as digestive surgery. Forty-four articles were found on these procedures. 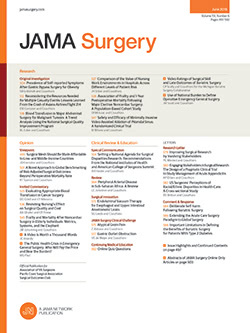 Of the 44 reports, 19 were case reports, 18 were original articles (setting criteria; the incidence of the trocar site hernia was clarified, and involved >100 patients), and 7 were technical notes on “how to do it.” We found an additional 19 articles using the references of those obtained (except for 3 gynecological articles).5,7,11 We, thus, reviewed 63 articles (24 case reports, 27 original articles, 7 technical notes, and 5 review articles). We finally chose trocar site hernia as the relevant medical term because it was the most frequently used and the one that most clearly expressed the condition. We can classify trocar site hernias into 3 types according to the reported cases (Figure 1). Early-onset type indicates dehiscence of the anterior fascial plane, posterior fascial plane, and peritoneum. The early-onset type was recognized in many case reports as beginning to develop in the early stages after surgery, often presenting as a small-bowel obstruction. The late-onset type indicates dehiscence of the anterior fascial plane and posterior fascial plane. The hernia sac of late-onset type is the peritoneum. The late-onset type has often been recognized, in many large series, to be related to complications of the trocar insertion. Late-onset type hernias almost always develop in the late stages several months after surgery. In morbidly obese patients, a thick preperitoneum predisposes the development of the Richter hernia, despite adequate fascial closure.15,16 This type was found in only 2 cases (noted above), and its clinical character is just like the early-onset type. Therefore, we did not create another classification for this type. It was important to identify which type of trocar site hernia was discussed in a report because every author’s concept regarding it might have been slightly different from another author’s. When we compare the incidence of trocar site hernias among several reports, we should consider the circumstances that the incidence might have been calculated from various kinds of denominators. So in this review we defined these 3 types as the trocar site hernia. We hope that this classification will clarify the definition of a trocar site hernia, enabling more accurate clinical identification and, thus, improving the care of patients. Several large series have been reported related to postoperative complications of laparoscopic cholecystectomy, where the incidence of trocar site hernia was 1 in 500 cases,17 3 in 1983 cases,18 1 in 800 cases,19 11 in 1300 cases,20 and 10 in 1453 cases.21 Callery et al3 mentioned that the overall incidence is very low, while Mayol et al22 stated that these figures represent the early results of laparoscopic surgery or gynecologic laparoscopy (ie, mostly diagnostic laparoscopy); currently an increasing number of publications have also drawn attention to this problem. Moreover the true incidence might be much higher than the reported figures as an unknown percentage of patients who are asymptomatic might not seek medical examination.6,8 Coda et al14 noted that the onset of trocar site hernia occurs later rather than immediately after surgery and might elude a surgeon in many surveys unless an extended follow-up procedure has been established. Recently, the incidence of trocar site hernia has been written about as a postoperative complication in gastrointestinal surgery (colorectal surgery for cancer, 0.6%23; colectomy for sigmoid diverticulitis, 0.9%24; Roux-en-Y gastric bypass, 0.3%25 and 1.0%26; and gastric banding, 0.5%27). Since 1995, large series on digestive surgery that focus on the theme of complications of the trocar site in digestive surgery have been published (Table 1). The incidence of trocar site hernia has been shown to be 0.65% to 2.80%. The studies based on Mayol et al22 and Nassar et al28 were based on data collected prospectively, and patients have been followed up for a minimum of several months; therefore, it is supposed that the incidence reported by them (1.50%-1.80%) would be reasonably standard. In the large series summarized in Table 1, trocars 10 mm or larger were used at 58 of 59 hernia sites. In the case reports listed in Table 2, trocar size was recorded in 24 ports (23 cases). In these cases, 10-mm or larger trocars were used in 18 hernia sites, an 8-mm trocar was used in 1 site, and 5-mm trocars were used in 5 sites. Although it is plain that the larger the trocar size, the higher the incidence of trocar site hernia, we cannot ignore the fact that trocar site hernias still occurred at 5-mm ports. In the large series summarized in Table 1, port site fascia were closed at 55 sites and left open at 5 (1 case had 2 hernia sites). The 22 cases that identified whether the fascia was closed or not are listed in Table 2; the fascial defect was closed in 8 and left open in 14. We think that leaving the fascial defect open is clearly correlated with a trocar site hernia. Probably insufficient closure, which sometimes occurs, will also increase the risk of a trocar site hernia. Open or Closed Laparoscopy. The pneumoperitoneum is established by Veress needle (closed laparoscopy) or the Hasson trocar insertion (open laparoscopy). The incidence of trocar site hernia in closed laparoscopy was higher than in open in the series by Mayol et al.22 They commented that wound infection might be more common in closed laparoscopy, which increases the incidence of trocar site hernia. Wallace and O’Dwyer52 performed open laparoscopy in 568 patients with no postoperative hernias, although the interval of the examination was only 1 week. There were few reports on the subject which lead us to assume that whatever method is performed has little influence on the development of a trocar site hernia. In a survey of the American Association of Gynecologic Laparoscopists, umbilical hernia was the most common (75.70%), otherwise lateral hernias were found in 23.70% of 152 trocar site hernias.36 This survey included not only therapeutic but also diagnostic laparoscopy as well, and a 10-mm trocar was not used in the lateral port. Therefore, the incidence of trocar site hernias in the lateral region is thought to be higher in digestive surgery than indicated by the data of Montz et al.36 In Table 2, trocar site hernias in the lateral region (except at midline) developed in 13 port sites while those in the midline developed in 17 port sites. We believe that the incidence of trocar site hernia in the lateral region is no less than in the midline. Effects of Compressed Air. Carbon dioxide might push the omentum or intestinal loops through the point of insertion in the fascia. The protruding structures might then be trapped by abdominal muscle contractions.6,8,32 Duron et al2 stated that a partial vacuum is created when the port is withdrawn, thus, drawing omentum and intestines into the fascial defect. Ninety percent of the trocar site hernias in the series by Azurin et al4 occurred in patients with comorbidities such as wound infection, diabetes mellitus, and obesity, although none of these reached statistical significance. Obesity. There was a trend for patients with trocar site hernias to have a higher body mass index (calculated as weight in kilograms divided by the square of height in meters),29 although this did not reach statistical significance. The morbidly obese are at a high risk for preperitoneal hernias because of their substantially thicker preperitoneal space and elevated intra-abdominal pressure.16 There was a tendency to improperly close the fascial defect in obese patients. We consider that this technical flaw has had an influence on the high incidence of trocar site hernias in obese patients. Nutrition. Consequent poor nutrition could be an important factor that might distinguish the various groups of patients for trocar site hernias14; however, it had not been made apparent in a report. Infection. A postoperative port site wound infection is one of the factors predisposing the development of a hernia.10,22,53 Callery et al3 reported that most often the umbilical incision is infected in laparoscopic procedures. Late-onset–type trocar site hernias might be related to infection from the stab wound, but there have been no large series reports clarifying any relationship between trocar site hernias and wound infection in digestive surgery. We could not find a report that analyzed the factors related to trocar site hernia by multivariate analysis. Therefore, we could not indicate the only independent risk factor. However, we have referred to many reports that have logically indicated pathogenesis. The authors frequently point out that the main pathogenesis is not host factors but rather technical ones; besides, most asserted that a large trocar size, leaving the fascial defect open, and stretching the port site were closely related to the occurrence of trocar site hernias. In the cases shown in Figure 2, the median interval in the late-onset cases was 5.5 months (21 days to 27 months). Twenty-eight (87.50%) in the late-onset cases presented a bulging abdomen without small-bowel obstruction. These cases correspond to the late-onset type. Only 1 in the late-onset cases presented strangulation at 27 months after laparoscopy.14 In Figure 2, the median interval in the early-onset cases was 5 days (range, 2-12 days). It was characteristic that the early-onset cases presented a small-bowel obstruction in 16 cases (76.20%). The protrusion of the small intestine or omentum was found in these cases. Early-onset cases correspond to the early-onset type and special type: most of these cases were of the early-onset type. It was shown that the incidence of Richter hernia was high in the early-onset cases (10 cases, 47.60%). Boughey et al35 found that Richter hernia typically presents with vomiting or nausea and a distended and painful abdomen, most commonly within 2 weeks of surgery. Duron et al2 reported no Richter hernia in cases of small-bowel obstruction after laparoscopic abdominal surgery, but other reports have disagreed with this. For example, Richter hernias are particularly common in symptomatic patients, presumably due to the small size of the fascial defect.6,8 When complicated, trocar site hernia usually occurs as a Richter hernia.4,33,51 In our collected cases, the Richter hernia was the cause of about half the cases in the early-onset cases. We indicate the correlations between 3 types of trocar site hernia and their clinical characteristics in Table 3. An unknown proportion of asymptomatic patients do not get physically examined,8 although asymptomatic lumps are sometimes found in late-onset–type hernias. There have been no reports on whether such insidious trocar site hernias in asymptomatic patients are worthy of any further examination. Some surgeons recommended the use of a fascial closure device,16 a spinal cord needle,57 a suture carrier,58 a 2-mm trocar,54 or a Deschamps needle59 to close the fascia and the peritoneum together. It would be advantageous to try one of these techniques if a fascial defect were not completely closed in the usual manner. It is difficult to close a 5-mm trocar site properly without enlarging the incision, so it might be better to use a device like those mentioned earlier if the fascial defect must be closed. Some authors have reported the usefulness of a new type of trocar: as 10- to 12-mm nonbladed trocar sites do not require fascial closure in nonmidline port sites above the arcuata line,60 so the frequency of trocar site hernias could be lowered significantly, from 1.83% to 0.17%, by switching from a sharp cutting device to a cone-shaped trocar tip61; and a radially expanding trocar might be useful to prevent hernias.62 It is supposed that these devices are recognized as useful, but a randomized large prospective study of digestive surgery is needed before abandoning fascial closure. Many authors have advised surgeons to open the trocar valve to deflate air before port removal so as not to draw omentum and intestines into the fascial defect.2,6,8,32 We should keep to this rule for deflating intra-abdominal compressed gas. Some reports recommended a paramedian skin incision and separate fascial incisions through the anterior and posterior rectus sheathes, with lateral retraction of the rectus abdominal muscle.29,63 In data by Lafullarde et al,63 laparoscopic digestive surgery was performed in 803 patients using the aforementioned trocar insertion with fascial closure. No patients developed trocar site hernia for 5 through 52 months after surgery.63 This method makes good use of the shutter mechanism of muscle and fascial layers, but we note that they added fascial closure to this method. We believe that the only effective way is closing the fascial defect and peritoneum to prevent trocar site hernias, and that the other methods should be used after improper closure for the worst cases. When active manipulation through a 5-mm port has occurred during prolonged procedures, the fascial defect should be closed to avoid complications. Duron et al2 investigated 24 cases of laparoscopic digestive surgery that were reoperated for mechanical intestinal obstruction; 11 (46%) were due to trocar site hernia, 8 (33%) to adhesions, 4 (17%) to gastric bands, and 1 to cecal volvulus. The median interval to reoperation was significantly shorter for trocar site hernias (8 days) than for adhesions (25 days) or gastric bands (22.5 days). This means that early onset of small-bowel obstruction is due to trocar site hernia. Velasco et al51 reported that all of their patients with early postlaparoscopic bowel obstruction required an operation to resolve small-bowel obstruction. They set 14 days after surgery to be the turning point for decision making. Moreover, some authors advised that correctly diagnosing Richter hernia in a postlaparoscopic patient with symptoms of small-bowel obstruction will help to lessen any delay.44,50 Therefore, surgeons need to be ready to perform further procedures on patients with a small-bowel obstruction within 2 weeks of laparoscopic surgery. If diagnosis of the obstruction cannot be verified, computed tomography will be effective. Nonoperative management (nasogastric suction and other methods) will often waste time and money, and they sometimes lead to critical conditions (ie, strangulation). The onset of trocar site hernia without small-bowel obstruction happens later and might elude a surgeon unless an extended follow-up procedure is established.14 One in the late-onset type developed strangulation 27 months after the operation. Therefore, a late-onset surgical repair procedure for trocar site hernia needs to be established, but a larger series study is needed to do this. Recently, laparoscopic repair of trocar site hernias has been reported to be feasible30 and further study is anticipated. In this review article, a classification of trocar site hernia was made by studying previous reports. We believe that a more accurate clinical identification is available from this categorization. It will be useful to prevent complications if the laparoscopist is aware of the correlation between the identified types and clinical manifestations before the surgical procedure. Correspondence: Masato Kusunoki, MD, Department of Surgery II, Mie University School of Medicine, Edobashi 2-174, Tsu, Mie 514-8507, Japan (kusunoki@clin.medic.mie-u.ac.jp). Accepted for Publication: November 18, 2003. Funding/Support: This study was supported in part by grants from Johnson & Johnson K K; Tokyo, Japan. Acknowledgment: We thank Kazuko Tonouchi for drawing Figure 1.